Maybe it’s true that you never know you love someone until you start complaining about them. If that’s so, then Gary Dahl drew the wrong conclusion from his friends he heard complaining about their pets. It was 1975, and not only had we put a man on the moon, we’d also invented the 8-track cassette. So why couldn’t we invent a way to make walking, washing, feeding and grooming our pets easier? Why couldn’t technology catch up? Dahl was no scientist or engineer, so there wasn’t much he could do to develop technology. But he was in advertising, which requires a different kind of creativity. Instead of innovative machines, advertisers’ skills run more toward a field of human endeavor that probably predates machines by millennia: getting people interested in something they neither want nor need. But what could Gary do? The solution, he figured, was to create a better pet. At least, to create a lower-maintenance pet for our busy, demanding, complicated lifestyles. The solution was a pet rock. Literally, Dahl purchased thousands of smooth rocks at the cost of about one cent apiece, and got straw for even less. He placed the rocks on a bed of straw inside a special cardboard box, and voilà: the pet rock! A real, live pet rock with its original packaging and guidebook. The pet rock would not starve, it would not wake you up in the middle of the night, it would not die, even if you neglected it. It was perfect for the self-centered pet owner! It took Dahl about six months from the moment he conceived of the pet rock until the time it was ready to go to market. Pet rocks were marketed and ready for shipping by October 1975, just in time for the Christmas shopping season. The most expensive part of Dahl’s operation, as it happened, was the design and manufacture of the box it came in. He wanted the box to look like the kinds of boxes you get at the pet store when you buy a new hamster or gerbil or guinea pig. The box announced the product and had rows of air holes at the top, just like it would for any other pet. The rock sat inside on a bed of hay, waiting for its new owner to shower it with affection. Also included with every pet rock was a manual that Dahl wrote titled “The Care and Training of Your Pet Rock”. This 32-page booklet explained why each pet rock is special, and gave careful, thorough instructions on how to train it. Commands like COME, SIT, STAY and PLAY DEAD are noted to be easy ones for pet rocks to master. Other tricks like ROLL OVER and SHAKE HANDS, the manual cautions, often might need a little assistance from the pet owner. Important instructions on how to take care of your pet rock, essential for any rock owner. The pet rock fad took off, and Dahl sold 1.5 million of them between October 1975 and February 1976, when sales started to slump. At $4.00 each, Dahl was a millionaire by the time it was all over. He took his money and opened a bar called Carrie Nations (a reference to the famous axe-wielding Kansas prohibitionist from the early 20th century), and continued to work in advertising. Dahl found the pet rock craze to be great fun at the time, but avoided publicity. He said he was afraid of all the weirdos who would approach him, and claimed he’d received threats from some of them. Possibly worse were the ones who approached him with ideas of their own, expecting Dahl to do for them and their ideas what he did with his own. “Some of them were really dumb ideas,” Dahl said in a rare 1988 interview, long after the pet rock fad had faded. In 2000, Dahl authored Advertising for Dummies, which was a more serious piece of work than his pet rock was (though it probably didn’t earn him as much money). I’ve never read the book, but I imagine it’s got to be pretty good. I’d trust a book on advertising written by a man who could make a million marketing rocks to people. 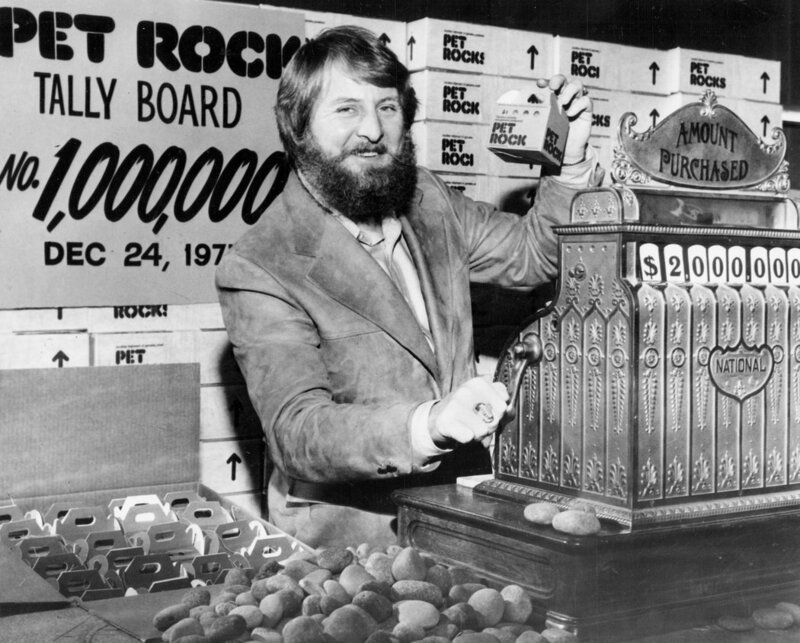 Gary Dahl holds up a pet rock in its box during the height of the pet rock craze: Christmas Eve, 1975.